Here is a wonderful cabinet photo of a group of very distinguished looking gents; the photograph was taken by H. Larock, Cabinet Portraits, Lewiston, Maine. Sadly, none of the men are identified. It's possible that the gentleman at front center is the father of the other five. Then again, they could all be members of the same organization. 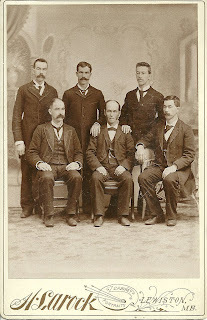 If you're familiar with Lewiston area genealogy and history or if you recognize any of these men from old family albums, please let me know.